Jang Geun Suk is a name that everyone has heard of if they’re at all in to any type of Korean media. Geun Suk has a typical pretty boy face, but is it too pretty to be natural? Rumors fly all around in the Korean tabloids about different idols and actors plastic surgery scandals including searches on naver about “Jang Geun Suk plastic surgery” and the like. Fans everywhere really want to know if their perfect faces are natural or if they’re only semi natural! This is understandable; no female wants to admit that a male is prettier than them naturally! Jang Geun Suk has been accused of having rhinoplasty to alter his nose bridge and nostril size many times. He has recently gone onto a variety show “Kneedrop Guru” to prove that his nose is indeed all natural! He poked and pushed and prodded his nose into extremely funny and unique ways to prove that the “Jang Geun Suk plastic surgery” rumors are completely false! Some of his alterations were reminiscent of the “pig rabbit” nose he popularized in the 2009 drama, “You’re Beautiful” with costar Park Shine Hye. He even made the statement that it amuses him very much when the makeup staff come around and are very gentle and careful when they apply around his nose because they too think he had some work done! 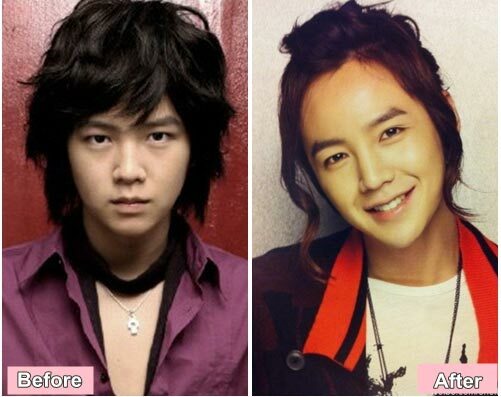 I wonder how many makeup artists had searched “Jang Geun Suk plastic surgery” before they got to work on him. Though the statements he made about his nose are believable, his chin on the other hand is suspicious. It’s popular in Korea to have a more pointed chin, and the chin bones don’t alter that much when you’re growing up. The pictures from when he was younger show he had a squarer chin, and when you look at him now there is a very nice prominent point to his chin that is very like was sculpted. But that is all up to interpretation. No one will ever know for sure if he has truly had surgery, well no one but him and his surgeon!